Markham, Ontario (Tuesday, December 6, 2006) -- It isn’t often that a production car is made that is so clearly superior that it is deemed to have no competition at all, but this year, at its annual Car of the Year awards presentation, the Automobile Journalists of Canada (AJAC) declared the Chevrolet Corvette Z06 to be just such a car. As a result, AJAC announced the creation of a completely new award to recognize a ‘truly exceptional vehicle that sets new standards’ and presented the inaugural “AJAC Most Coveted Vehicle” award to General Motors of Canada for the Corvette Z06. Car wheel maker files for bankruptcy again! GAS CITY, Ind. (AP) — An auto parts supplier has filed for bankruptcy for the second time in a year, citing a loss of business from General Motors Corp.
Amcast Industrial Corp. expected new and continued business from GM — the source of about 80 percent of Amcast's revenue — after it reorganized and emerged from its first Chapter 11 bankruptcy filing last summer, according to documents filed Thursday in U.S. Bankruptcy Court in Indianapolis. "Neither of those assumptions has proven to be true," Amcast officials said in court documents. "Not only has GM cut back on existing programs in some areas, but has also told Amcast that no new business would be given to Amcast and existing programs would be migrated away from Amcast in the coming months." Amcast, based in the northeastern Indiana town of Fremont, employs 727 workers at plants in Fremont, Franklin and Gas City. The company makes aluminum wheels for cars and trucks and aluminum castings used for automobile suspensions, brakes and steering. The bankruptcy filing allows Amcast to continue doing business while resolving its issues with GM, company officials said in a news release. "In the meantime, employees will be paid their normal wages and bonuses and all benefit programs will continue uninterrupted," said Richard A. Lindenmuth, Amcast's interim chief executive officer. "We have funding arrangements in place with our existing lenders to continue operations during the bankruptcy case. We hope to conclude the process as promptly as possible." In an attempt to restore its own profitability, GM recently announced that it would cease production at 12 facilities within the next two years and eliminate 30,000 jobs. GM officials were aware of Amcast's bankruptcy filing but would not comment on any loss of business, said Tom Hill, a spokesman for the automaker. "As a policy we don't comment on contracts with any suppliers," Hill said. "I can tell you that Amcast is a GM supplier and we are aware they filed for bankruptcy." Here's the schedule for 2006... This coming year, the C5-R's will be in Utah and Texas. Only one race in California. David C. Hill ( our HERO ) Retires ! The C5/C6 Registry has learned that David C. Hill, chief engineer for Corvette has announced his retirement effective January 1, 2006. David C. Hill is also Vehicle Line Executive for GM Performance Cars, including the Chevrolet Corvette and Cadillac XLR luxury roadster, a position he has held since 1995. Vehicle Line Executives have full responsibility for the success of their vehicles in the marketplace, integrating and managing functions such as design, engineering, manufacturing, finance and marketing. We have learned Tom Wallace will move to the position of VLE for Corvette, Solstice, and Sky on November 1st, He and Mr. Wallace will work together during the transition. Mr. Wallace will also serve as chief engineer of C6 Corvette. Tom Wallace's back ground is with the very successful Grand National Buicks of the mid-80's. Both he and his son are both avid racers. Born January 15, 1943, Hill earned a Bachelor of Science in Mechanical Engineering from Michigan Technological University in 1965 and a Master of Science in Mechanical Engineering from the University of Michigan in 1970. Hill began his career with Cadillac Motor Car Division in 1965. From 1965 to 1973 he served as senior project engineer in the Cadillac engine lab. In 1973, Mr. Hill became a staff project engineer for Cadillac engine design and release, holding that position until becoming general supervisor of the body and chassis lab in 1976. From 1978 to 1981, Mr. Hill served as staff engineer for Cadillac car development. In 1982 he became a Cadillac staff engineer for emissions and transmissions. Later that year he was promoted to vehicle chief engineer for the Cadillac Allante. In 1988 Mr. Hill’s responsibilities were expanded as he was named chief engineer for the Cadillac DeVille and Concours. He became engineering program manager for Cadillac in 1992, before moving to the chief engineer role for Corvette later that same year. Since the Registry's inception in 1997, Mr. Hill has been a friend and strong supporter of the Registry and it's members. He always said the Corvette under his watch was the "Best Corvette Yet". We agree Mr. Hill, first, the C5, then the Z06, followed by the C6 and the awesome Z06-C6. Always a fan of Corvette and friend to it's owners, we look forward to continuing to see Mr. Hill at future Registry and Corvette. events. We wish you a wonderful and full filling retirement David, and from all of us at the registry ..... THANK YOU! David... Let us know where the retirement party is... We'll ALL BE THERE! The duPont REGISTRY Exotic Car Buyers Guide 2006 has named the505-hp Corvette Z06 the “Best Bang for the Buck” in the annual special issue that’s focused on exotic vehicles from the top manufacturers in the world. Members, for months now we have been receiving email after email about why F55 Magnetic Suspension Corvettes do not have the slotted rotors available as part of their suspension option. It’s clear that all the chatter on the C5/C6Net and emails from all of you are being heard at the highest levels. 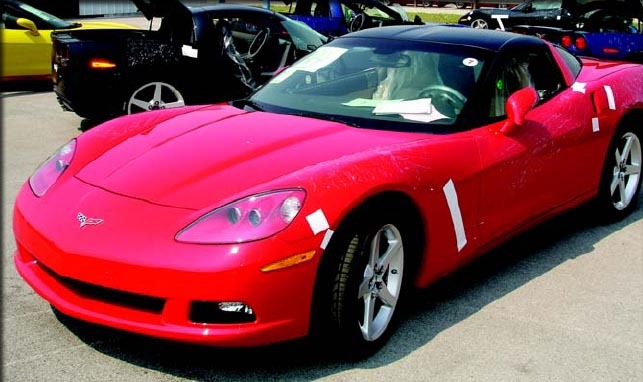 Chevrolet is sending you the last 2005 Corvette, job number 043794, it rolled off the end of the line on Thursday, September 8 at about 7:30 a.m. The victory red coupe was bound for Atlantic City, New Jersey to Kerbeck Chevrolet. The car was VIN 1G1YY24U855137341, with a price tag of $51,615. This is not only the last 2005 C6, but the end of an era! This is the LAST 4 Speed automatic Corvette! There will be no more! The C6 is one of the most well received Corvettes. For a larger view of this last 2005 Click here or click the image. In a competition among seven open-air sports cars performed by Consumer Reports, the Chevrolet Corvette was ranked number three overall, just behind the Mercedes-Benz SLK and the Porsche Boxster. The top three were followed by the Nissan 350Z, the Honda S2000, the BMW Z4, and the Lotus Elise. The Corvette provides abundant torque and power on demand, and sounds invigorating when pushed. It’s both a comfortable cruiser and an exciting sports car. It has a roomy interior and the optional power top is simple to use. The Driving Experience – On the track, the Corvette is controllable at its very high limits. The standard ESC allows for aggressive driving, particularly in competition mode, but still keeps the car on course. The 400-hp, 6.0-liter V8 performs effortlessly in any gear. The six-speed manual has well-spaced ratios. Fuel economy is a respectable 21 mpg on regular. Inside The Cabin – The Corvette has a nice looking interior. There is plenty of room, good pedal placement, and view forward. The wide seats are comfortable for most. Side bolsters can be adjusted for a snug fit, but some found the seatback too soft. Gauges and controls are easy to read and use. A heads-up display on the windshield can show both rpm and speed. HIGHS – Acceleration, torque, V8 sound, relatively roomy cockpit and trunk, controls, uses regular fuel. Registry Members on TV !!! Thursday, September 1st at 7:00 pm on Discovery Times channel 143. "Corvette: Rebuilding an Icon" on channel 143 Discovery Times will feature Registry members at the Detroit Auto Show with the unveiling of the Sunset Orange C6. Several registry members are interviewed at the end of the show, along with our fearless leaders, Dan and Jake. Remember, Thursday, September 1st at 7:00 pm on Discovery Times channel 143. You will want to record this! ELKHART LAKE, Wis. - On a picture-perfect day at Road America, Corvette Racing turned in another perfect performance. A .132-second victory by Oliver Gavin and Olivier Beretta in the No. 4 Compuware Corvette C6-R over their Corvette Racing teammates Ron Fellows and Johnny O'Connell mathematically clinched the GT1 manufacturers championship for Chevrolet and the team championship for Corvette Racing. Today's victory was the fourth win in five races for Gavin and Beretta, including their victory in the 24 Hours of Le Mans. The "two Ollies" moved to within three points of Fellows and O'Connell (127-130) in the race for the GT1 drivers championship with three races remaining. A Moment of Adrenaline... A Lifetime of Performance! Billy Boat Performance Exhaust is the single source for high performance exhaust components with a deep commitment to customer service. You can rely on Billy Boat Performance Exhaust for aircraft quality, T304 stainless steel headers and exhaust systems for your C5 and C6 Corvette. Whether you want an entire system, headers, or just cat back components, the technical sales staff is ready to help you. Members don't forget to support our Corporate Members! CLICK HERE for the Billy Boat Performance Exhaust Press Release. Information on all the changes, improvements, enhancements, and the new six-speed paddle shift automatic transmission are now on line! CLICK HERE for the latest scoop! 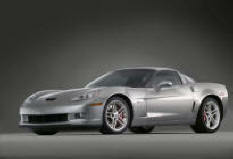 The pricing and options for the 2006 Corvette have been announced and as usual, we've posted them on line. Please notice the new Option MXO Six Speed Automatic with "Paddle Shift" and the new Option QX3 Chrome Aluminum Wheels. CLICK HERE for the new Guide. Journalists recently got a chance to get behind the wheel of the ultimate Corvette - the Z06. They took this fastest-Corvette ever out to two famed Formula One tracks - Nurburgring in Germany and Spa in Belgium, and got some time on the Autobahn as well. 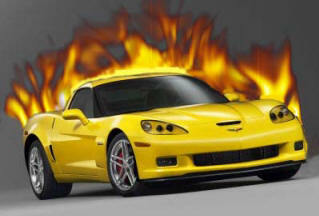 The Corvette Z06 achieves 0-to-60 acceleration in 3.7 seconds. In addition to boosting the engine to 505 horses, the Z06 differs from the standard Corvette coupe in a number of ways including a lightweight aluminum frame, a dry-sump engine lubrication system like a racecar, a cold-air scoop on the hood, carbon fiber fenders, and a taller rear spoiler. Articles on the Z06 will hit magazines and newspapers in October. 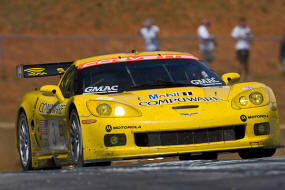 Z06 and our Le Mans winning C6-R will air on The Learning Channel on Tuesday, August 16, 2005. Check your local listings for actual air times but the network tentatively says the show - will run at 8PM (Eastern time) and then repeat at 11PM . CORVETTE "Blue Devil" Fact or Fiction? LE MANS, France - Corvette Racing made history today at the 24 Hours of Le Mans, scoring its fourth 1-2 finish in the GT1 class in five years with the new Corvette C6.R. Corvette Racing drivers Oliver Gavin, Olivier Beretta and Jan Magnussen reprised their victory in last year's 24-hour endurance race, and were again joined on the podium by teammates Ron Fellows, Johnny O'Connell and Max Papis. The team celebrated Corvette's 45th anniversary at Le Mans in style, finishing fifth and sixth overall. Corvette Racing turned back the challenge of the Aston Martin team in a hard-fought battle that often saw all four cars on the same lap. In scorching heat, the twin yellow Corvettes completed 349 and 347 laps respectively, scoring the 38th win for Corvette Racing in international road racing and the team's 25th 1-2 finish. Last weekend, Corvette Racing introduced its new C6.R racecars to Le Mans in a day of trouble-free testing on the Circuit des 24 Heures. The extended test session provided valuable information on the new racecars for both Corvette Racing’s six drivers and GM Racing engineers, and it was the only opportunity for the team to evaluate the new cars before the start of official practice and qualifying on June 15. The No. 64 Compuware Corvette C6.R driven by Oliver Gavin, Olivier Beretta and Jan Magnussen ran a fast lap of 3:54.183, placing it fourth among the nine GT1 class cars on the course. The No. 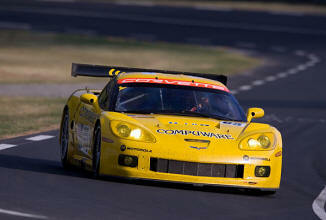 63 Compuware Corvette C6.R of Johnny O’Connell, Ron Fellows and Max Papis completed the 13.6- kilometer circuit in 3:56.174, placing it sixth on the GT1 speed chart. The No. 63 Corvette ran a total of 91 laps, the most by a GT1 entry, and its sister car completed 89 laps. Neither car had any mechanical issues as the team evaluated tires, brakes, shock absorbers and aerodynamic settings. Practice and qualifying for the 24 Hours of Le Mans is scheduled on June 15-16. The race begins on June 18. Employee discount available to America! DETROIT - For the first time in its history, GM is offering its employee discount to everyone who takes delivery of a new 2005 GM car or truck from June 1 through July 5, 2005.